On behalf of POINT 27, we would like to offer condolences for Deputy Sheriff Jacob Keltner. Please know we are eternally grateful for Jacob’s service and his ultimate sacrifice. 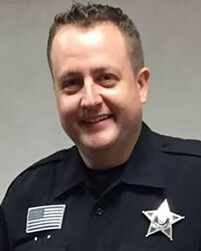 To honor Deputy Keltner, POINT 27 sent 27 Thin Blue Line Dog Tag Necklaces, engraved with “Blessed are the Peacemakers for they will be called children of God” Matthew 5:9, to the McHenry County Sheriff’s Department for Jacob’s partner and fellow officers. POINT 27 sent Folded Flag Necklaces engraved with “Greater Love has no one than this; than to lay down one’s life for one’s friend” John 15:13 for Deputy Keltner’s wife and children. Blessed are the peacemakers, for they will be called children of God. Matthew 5:9 you made the ultimate sacrifice, We will take it from here brother. Rest in Peace Deputy, you will not be forgoten. Thank you for your service brother, may you rest in the love and paradise of heaven. Peace be with your family during this hard time. Your sacrifice will never be forgotten. Clear to 10-7 brother, job well done, we will take the watch from here. Semper Fi Deputy. Your service will never be forgotten and God bless you and your family. Be assured that your brothers and sisters in Blue will take it from here. Rest In Peace. Thank-you, Sheriff Keltner for your service. Thank-you for being willing to sacrifice your life so that we can be safe and live in peace. My heart is with your family. Well done, good and faithful servant. Godspeed. Sir, I would just like to say thank you for your service and sacrifice for the citizens of McHenry County. And to your Family and loved ones, I wish to extend my deepest sympathy. My heart goes out to family, friends and fellow officers of Deputy Keltner. RIP my brother. On behalf of the Chicago Police Lieutenants Assn. I would like to extend our deepest condolences to the Keltner family and to all Officer Keltner's fellow officers. Our thoughts and prayers are with you. Another hero taken from us too soon. President, Chicago Police Lieutenant's Assn. State Correctional Officer Ca (ret) E.S. Sorry for your family's loss and your Department's loss. Rest in Peace, my brother. My sympathy to your family and the McHenry County Sheriffs Office. City of Fond du Lac Wis., Police Dept. Prayers to the family, friends, and his brothers and sisters in Blue. You will never be forgotten. Go with God. Officer Keltec thank you for leading they way and paying the ultimate sacrifice. May God watch over your friends and loved ones. Rest in Peace Deputy Keltner. Thank you for your service. My thoughts and prayers are with the Keltner Family and the McHenry County Sheriff's Office.